Keywords: Nutritional Deficiency. Micronutrients. Hypomagnesaemia. Chronic alcohol consumption is associated with many physical and neuropsychiatric complications. Patients in alcohol withdrawal often develop delirium tremens. Many factors including nutritional deficiencies are associated with the development of delirium. Low levels of micronutrients, such as magnesium, selenium, zinc, have been reported in patients with chronic alcohol intake. Magnesium is a cofactor in the transphosphorylation with adenosine triphosphate. Human adult requires about five mg of magnesium/KgWt/day. Various diseases, including chronic alcoholism, lead to magnesium deficiency. Hypomagnesaemia in alcohol dependence results from various pathophysiologic mechanisms, such as reduced intake, increased renal excretion and gastrointestinal loss, phosphate deficiency and vitamin D deficiency. [3-5] Several studies report hypomagnesaemia among alcohol users. [6-10] One study reported 29.9% prevalence of hypomagnesaemia among 127 chronic alcoholics. Apart from magnesium, other electrolytes, such as sodium, potassium, phosphate, and chloride, were found to be disturbed in individuals with chronic alcoholism. [3-5] Study by Stasiukyniene reported 14% of subjects as having disturbances in sodium and potassium along with magnesium. A decrease in serum magnesium levels with increase in serum alcohol concentration has also been observed in acutely intoxicated alcoholic patients. A study of 50 patients in the age group of 30-70 years showed a significant reduction in serum magnesium levels (1.93±0.11 mg%) compared to controls (2.67±0.26 mg%). Complications, such as cardiac arrhythmias, hypertension, and abnormal platelet function, were often attributed to low magnesium levels in alcoholic patients. [13,14] Serum magnesium constitutes around one per cent of total body magnesium. [15,16] Total and ionized magnesium in serum was found to be reduced in emergency care patients with ethanol consumption. Oral magnesium was found to have hypotensive effects in rats with alcohol-induced hypertension. Borah et al. reported a lower serum magnesium in patients with delirium tremens compared to those without delirium tremens. Severe delirium tremens tends to persist longer even after thiamine replenishment. Though several studies observed magnesium deficiency in chronic alcoholics, the relationship between this deficiency and the delirium has not been well studied. In this background, this study may help us to throw light into the relationship between serum magnesium level and alcohol withdrawal delirium. To estimate serum magnesium levels of patients in alcohol withdrawal state. To study the association of serum magnesium levels with severity of delirium. This study was conducted in the Department of Psychiatry, Government Medical College, Kozhikode, Kerala, India. This was approved by the Institutional Ethics Committee for Research. This was a prospective study in which assessment was done on day one, day three, and day five of admission. All inpatients with alcohol withdrawal symptoms in the age group of 18-60 years, who gave informed written consent, during a four months period from August to November 2017 were included. Those individuals having other acute medical conditions and chronic renal failure were excluded. 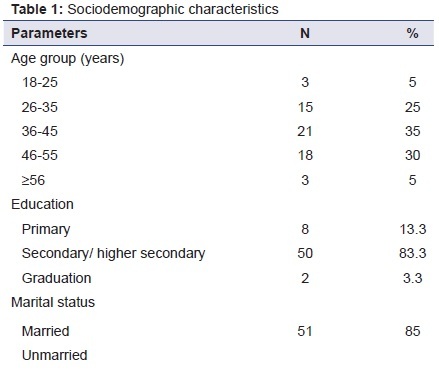 Sociodemographic and clinical details were recorded using a proforma designed for this purpose. Clinical diagnosis was made according to the tenth revision of the International Statistical Classification of Diseases and Related Health Problems (ICD-10) criteria. Severity of withdrawal state was assessed using the revised clinical institute withdrawal assessment for alcohol scale (CIWA-Ar). The severity of delirium was rated using the Delirium Rating Scale-revised-98 (DRS-R-98) on day one, day three, and day five of admission. Both the clinical interview and ratings were done by the second author. Subjects were interviewed between 8 AM and 2 PM. Considering the clinical severity and influence of treatment, a DRS-R-98 score of four or more was taken as having delirium and CIWA-Ar score of ten or more was considered as having moderate or severe withdrawal. Serum magnesium level was estimated within 24 hours of admission and subsequently on day five using colorimetric end point method. The normal reference value of magnesium was 1.6-2.6 mg% and a value less than 1.6 mg% was considered as hypomagnesaemia. Statistical analysis was performed using SPSS Version 17 (SPSS Inc., Chicago, USA). Quantitative variables like magnesium, sodium levels were presented as mean±standard deviation (SD). Qualitative variables were summarised as frequency and percentage. Comparison of mean magnesium between groups were tested using the Mann Whitney U test as the magnesium level was not normally distributed (p<0.05 using the Shapiro-Wilk test for normality), and magnesium levels before and after were compared using the Wilcoxon signed-rank test. Correlation between CIWA score and magnesium levels were tested using the Spearman correlation coefficient. A p-value <0.05 was considered statistically significant. This study comprised 60 men with a mean age of 40.6±9.2 (range 22-57 years). 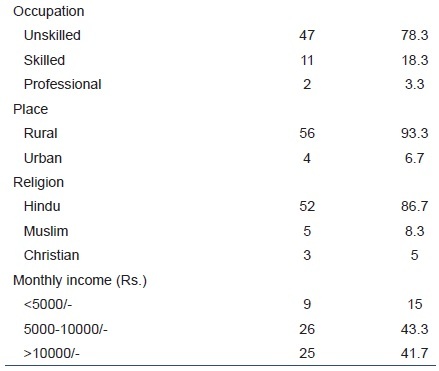 Sociodemographic details are shown in Table 1. Forty two (70%) subjects had a duration of alcohol use for more than ten years. Forty one (68.3%) were abstinent for less than 48 hours at the time of interview and 20% (n=12) had a CIWA score of more than or equal to ten. Forty nine (81.7%) reported nicotine abuse but none had other substance use. The subjects who scored more than or equal to four on DRS were 33.3%, 20%, and 6.7% on day one, three, and five respectively. Twenty percentage (n=12) of the subjects had a low serum magnesium level on day one and 11.7 percent (n=seven) were having a low magnesium level on day five. Mean serum magnesium level was found to have changed significantly from day one to day five (mean±SD of magnesium changed from 1.74±0.25 mg% on day one to 1.83±0.22 mg% on day five with a p-value of 0.002 by Wilcoxon signed-ranks test (Z=3.07)). Mean magnesium level for those with DRS score of four or more was 1.73±0.13 mg% and 1.78±0.21 mg% on days one and five respectively. DRS scores improved significantly from day one to day five (mean DRS of 4.48±5.38 on day one to 0.75±1.79 on day five with a p<0.001 by Wilcoxon signed-ranks test (Z=5.98)). The association of hypomagnesaemia on day one and DRS scores of less than four on different days are shown in Table 2 along with the p-values obtained by Chi-square test. Mean sodium level was 138.38±3.49 mEq/L. Five (8.7%) subjects had sodium value less than 135 mEq/L. All subjects had normal potassium level. The serum magnesium levels on day one did not have a significant relationship with the lower or higher DRS scores on day one, three, or five (p=0.49, 0.63, and 0.30 as shown in Table 2). No significant rise in serum magnesium was noticed in those with higher DRS scores. The relationship between change in serum magnesium levels and DRS score, duration of alcohol use, and abstinence are shown in Table 3. No significant relation was noticed in the mean serum magnesium levels on day one or day five with regard to duration of alcohol use (p=0.716, p=0.315), duration of abstinence (p=0.803, p=0.967). CIWA scores did not show any significant correlation with magnesium levels on day one (Spearman rho=-0.20 with a p=0.135) or day five (Spearman rho =-0.15 with a p=0.253). The available sample comprised only men as alcohol use is not very common among women in our culture. Prevalence of hypomagnesaemia in our subjects is consistent with similar findings from many studies that reported a high rate of hypomagnesaemia in patients with alcoholism. [1,2,6-11] Stasiukyniene reported 29.8% prevalence of hypomagnesaemia in their subjects which is comparable to our study. In a comparative study involving 50 patients with chronic alcoholism and healthy controls, Ashalata et al. observed a significantly low serum magnesium levels (mean 1.93±0.11 mg%) among alcohol dependent subjects. Even though our study is in agreement with the above study with regard to hypomagnesaemia, we could not find a statistically significant reduction in magnesium levels of alcohol dependent individuals, probably due to the difference in methodology. The observed change in magnesium level from day one to day five is in agreement with De Marchi et al. who reported a significant change in mean serum magnesium levels from day one to day four of abstinence. Similarly, in a comparative study, Prior et al. reported significant change in serum magnesium level of alcoholics two weeks after abstinence. However, those with higher DRS scores did not show a significant rise in magnesium levels on day five compared to those with lower scores. This may indicate the possibility of relationship between severity of delirium and serum magnesium level. A comparable observation was made by Borah et al. where a lower serum magnesium was seen in patients with delirium tremens compared to those without. Though the mean magnesium levels were found to be in the normal range irrespective of the duration of abstinence, duration of use, or DRS score, the increase in magnesium level from day one to day five was found to be significant in these groups. This is in agreement with another study that showed a significant increase in serum magnesium level a few days after abstinence. Though a comparatively higher serum magnesium was noticed in those with less than ten years of alcohol abuse, no significant relationship was noticed between serum magnesium and duration of alcohol use. Similar observation was made by Enadle in 100 chronic alcoholics in withdrawal state. The same study reported no significant difference in serum magnesium levels of patients with mild or moderate withdrawal symptoms which is similar to our observation. Previous researches recommended magnesium therapy to correct hypomagnesaemia as it may reduce severity of delirium tremens by reducing neuromuscular excitability. [25,26] As results from this study and previous studies indicate hypomagnesaemia in alcohol dependents, we would suggest correction of serum magnesium level that may help to reduce complications of alcohol withdrawal. As there are no definite evidence of specific benefits of magnesium therapy, more researches to be done to study its impact on severity and course of delirium tremens. Sample size is small and this study was conducted at a tertiary care centre. Hence, the results may not be generalised. No comparison group was available. A significant number of alcohol withdrawal patients show hypomagnesaemia. There is a significant change in magnesium level during abstinence except for those with higher delirium scores which probably reflects the relationship between serum magnesium level and severity of delirium. Correcting serum magnesium levels may reduce the severity of delirium tremens. 1. Ham BJ, Choi I-G. Psychiatric implications of nutritional deficiencies in alcoholism. Psychitr Invest 2005:2;44-59. 2. Flink EB. Nutritional aspects of magnesium metabolism. West J Med. 1980;133:304-12. 3. De Marchi S, Cecchin E, Basile A, Bertotti A, Nardini R, Bartoli E. Renal tubular dysfunction in chronic alcohol abuse--effects of abstinence. N Engl J Med. 1993;329:1927-34. 4. Elisaf M, Kalaitzidis R. Metabolic abnormalities in alcoholic patients: focus on acid base and electrolyte disorders. J Alcohol Drug Depend. 2015;3:185. 5. Stasiukyniene V. [Blood plasma potassium, sodium and magnesium levels in chronic alcoholism during alcohol withdrawal]. [Article in Lithuanian] Medicina (Kaunas). 2002;38:892-5. 6. Enadle R. A study of serum magnesium level in alcoholic withdrawal patients. Inter J Curr Trends Sci Tech. 2015;16:463-65. 7. Kulkarni SR, Ravindra KP, Dhume CY, Rodrigues E, Karapurkar M. Hypomagnesemia in alcohol dependent population from the lower socio-economic background who were consuming illicit liquor and attending the de-addiction center. Int J Pharm Bio Sci. 2012;3:495-502. 8. Ashalata K, Kumari PK, Vijaya Babu PVSS, Nagamani M, Kumari KL. Serum magnesium and other electrolyte levels in chronic alcoholic patients in a tertiary mental care centre in north costal Andra Pradesh India. IOSR J Dent Med Sci. 2015;14:35-7. 9. Turecky L, Kupcova V, Szantova M, Uhlikova E, Viktorinova A, Czirfusz A. Serum magnesium levels in patients with alcoholic and non-alcoholic fatty liver. Bratisl Lek Listy. 2006;107:58-61. 10. Gandhi PA, Sendhav SS, Sanghani HI, Patel AP. A study on changes in serum GGT and magnesium level in alcohol liver disease. Int J Med Res Health Sci. 2014,3;12-5. 11. Liamis GL, Milionis HJ, Rizos EC, Siamopoulos KC, Elisaf MS. Mechanisms of hyponatraemia in alcohol patients. Alcohol Alcohol. 2000;35:612-6. 12. Petroianu A, Barquete J, Plentz EG, Bastos C, Maia DJ. Acute effects of alcohol ingestion on the human serum concentrations of calcium and magnesium. J Int Med Res. 1991;19:410-3. 13. Abbott L, Nadler J, Rude RK. Magnesium deficiency in alcoholism: possible contribution to osteoporosis and cardiovascular disease in alcoholics. Alcohol Clin Exp Res. 1994;18:1076-82. 14. Sharain K, May AM, Gersh BJ. Chronic alcoholism and the danger of profound hypomagnesemia. Am J Med. 2015;128:e17-8. 15. Ordak M, Maj-Zurawska M, Matsumoto H, Bujalska-Zadrozny M, Kieres-Salomonski I, Nasierowski T, et al. Ionized magnesium in plasma and erythrocytes for the assessment of low magnesium status in alcohol dependent patients. Drug Alcohol Depend. 2017;178:271-6. 16. Fawcett WJ, Haxby EJ, Male DA. Magnesium: physiology and pharmacology. Br J Anaesth. 1999;83:302-20. 17. Wu C, Kenny MA. Circulating total and ionized magnesium after ethanol ingestion. Clin Chem. 1996;42:625-9. 18. Hsieh ST, Sano H, Saito K, Kubota Y, Yokoyama M. Magnesium supplementation prevents the development of alcohol-induced hypertension. Hypertension. 1992;19:175-82. 19. Borah AJ, Deka K, Bhattacharyya K. Serum electrolytes and hepatic enzymes level in alcohol withdrawal patients with and without delirium tremens - a comparative study. Int J Health Sci Res. 2017;7:74-83. 20. World Health Organization. The ICD-10 classification of mental and behavioural disorders: clinical descriptions and diagnostic guidelines. Geneva: World Health Organization; 1992. 21. Sullivan JT, Sykora K, Schneiderman J, Naranjo CA, Sellers EM. Assessment of alcohol withdrawal: the revised clinical institute withdrawal assessment for alcohol scale (CIWA-Ar). Br J Addict. 1989;84:1353-7. 22. Trzepacz PT, Mittal D, Torres R, Kanary K, Norton J, Jimerson N. Validation of the Delirium Rating Scale-revised-98: comparison with the delirium rating scale and the cognitive test for delirium. J Neuropsychiatry Clin Neurosci. 2001;13:229-42. 23. Prior PL, Vaz MJ, Ramos AC, Galduróz JC. Influence of microelement concentration on the intensity of alcohol withdrawal syndrome. Alcohol Alcohol. 2015;50:152-6. 24. Hristova EN, Rehak NN, Cecco S, Ruddel M, Herion D, Eckardt M, et al. Serum ionized magnesium in chronic alcoholism: is it really decreased? Clin Chem. 1997;43:394-9. 25. Zakhari S, Altura BM. Alcohol and magnesium. Introduction to the symposium. Alcohol Clin Exp Res. 1994;18:1037-9. 26. Mayo-Smith MF, Beecher LH, Fischer TL, Gorelick DA, Guillaume JL, Hill A, et al. ; Working Group on the Management of Alcohol Withdrawal Delirium, Practice Guidelines Committee, American Society of Addiction Medicine. Management of alcohol withdrawal delirium. An evidence-based practice guideline. Arch Intern Med. 2004 Jul 12;164:1405-12.